We created personas to help you better define the OpenStack end-users who benefit from your OpenStack contributions. After much qualitative and quantitative research, we identified five personas that embody the most common roles performed by OpenStack users. We also considered where these personas fit into the cloud adoption workflow and how their roles may change depending on the size and user ecosystem of their company. You can utilize these personas in the design and development stage to help ensure user-centric contributions and well defined use cases. When used consistently, personas can help ensure your contributions lead to a positive user experience for OpenStack adopters. Adrian is responsible for the strategy and road-map for his company’s cloud and identifies reasons to compel management to adopt OpenStack for production environments. Rey is involved in installing, operating, using, and updating the OpenStack cloud services. Taylor manages the relationship with the cloud services provider. This includes managing quotas, number of users, applicable policies, and support tickets. Wei manages projects by adding or removing project members’ access to the cloud instance. Wei’s main concern is to have enough resources available to support Wei’s projects. Quinn develops and deploys cloud applications but does not necessarily know much about the underlying infrastructure of the cloud. 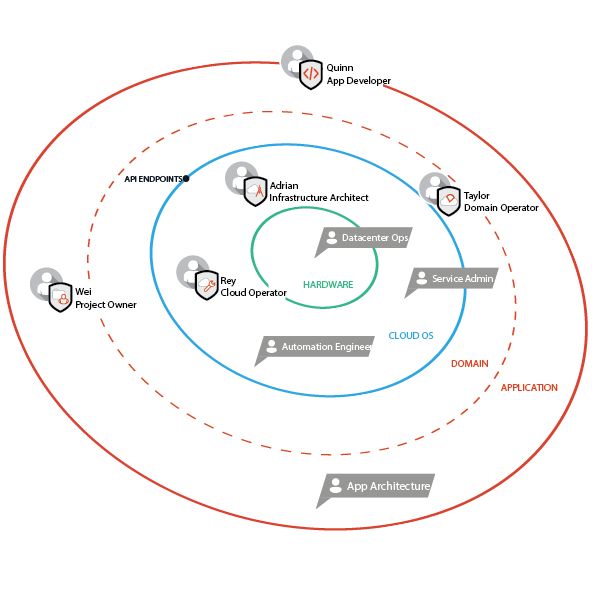 To better understand each persona role, see the following overall role ecosystem, which is based on levels of abstraction from hardware to application level. Within this ecosystem, we can see the current personas as well as candidates for future personas. Nikishi University - research - Academic/Nonprofit Wants to provide cloud services to their internal labs and have bare metal. Do not want to hire resources internally to deploy trunk. CNBB Securities - large enterprise - Enterprise Wants to provide cloud services to internal customers for applications that are not customers facing. Has both bare metal and operations. Rifkom - service provider - Service provider Wants to provide services to external customers that do not want or have internal resources. Has both bare metal and operations resources internally. MOI - customer - Small/medium business Wants to deploy customer-facing applications, but do not have bare metal or a budget for operations resources.